To the world, the spirit of Christmas has long been embodied by the jolly figure of Santa Claus. What the world doesn't know is that the role of Santa Claus has been passed down through several generations. The current Santa, Malcom Claus, has spent 70 years dutifully carrying out his yearly mission and is nearing retirement. His eldest son, Steve, is eager to take up his father's mantle as the new Santa. With his army of elves and hi-tech gadgets delivering presents with speed and efficiency, Steve believes he is a perfect fit for the job. Malcom's father, the long retired Grandsanta, criticizes the yearly spectacle and how Steve's gizmos can't compare to the traditional sleigh and reindeer. All the while Malcom's youngest son, Arthur, watches the event with his usual energized enthusiasm. However, when it is discovered that a child's present was never delivered, the family becomes fractured on how to handle this situation. Determined not to let the missed child down, Arthur resolves to overcome his many fears in order to deliver the present. But will he be able to deliver it in time before the sun rises on Christmas morning? 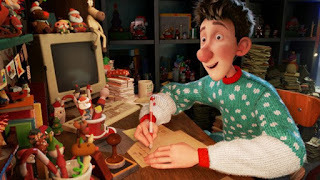 Arthur Christmas is a computer animated Christmas film that was originally released on November 11th 2011 in the UK, while in the US it was released November 23rd. The film was directed by Sarah Smith (her first time directing a feature film) with Barry Cook (Co-director of Disney's Mulan) acting as co-director. This film also marked the first collaborative project between Aardman and Sony Pictures Animation. 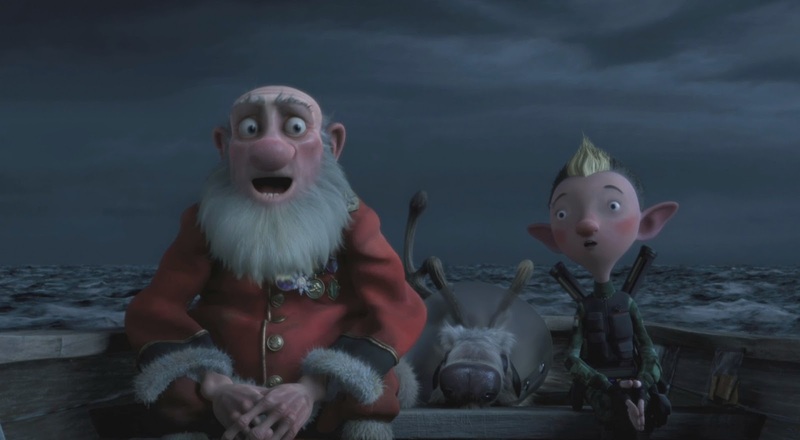 The film features the voice talents of James McAvoy (Arthur), Hugh Laurie (Steve), Bill Nighy (Grandsanta), Jim Broadbent (Malcom), Imelda Stauton (Magaret Claus) and Ashley Jensen (Byrony). You would think that an animated movie with the name Aardman attached to it would have had me scrambling to see it the day it came out. Unfortunately, I was juggling my college career and getting ready for Thanksgiving with my family. Even after entering the Christmas season I failed to see the film during its theater run. At the time, I favored the old favorites to get me hyped for the festivities. Worried that watching anything new would disrupt the yearly tradition that I had become so comfortable with. It wasn't until several Christmas' later that I happened upon film again while it was playing on television. I gave it a watch...and found myself not just entertained but perplexed. The film that I had passed by in order to stick to tradition, in its own charming way, had a great deal to say about embracing both the old and the new. The tone is set by the opening, as we get a glimpse into what the night of Christmas Eve is like for the Claus family. The wooden sleigh and team of reindeer have been traded in for the S-1, a technologically advanced aircraft in the shape of a sleigh. Santa is aided by team of highly trained team of elves who infiltrate and deliver presents with the speed and precision. The entire sequence is as amazingly animated as it is hilarious and acts as a nice introduction to each of the main members of the cast. It also provides a fun theory to the age old childhood question, "How can Santa deliver over a 2 billion presents in one night?" The charm and creativity of Aardman's studio's animation talent is on full display in this film. 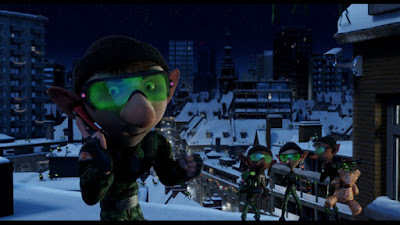 Despite the fact this was their first feature film told through 3-dimensional computer animation, you can see hints of their trademark character design. And while I adore the studio's work in Stop motion animation, I don't believe this movie would have the same impact if it had been animated in any other way. It would still be funny and charming, but a lot of the faster-paced scenes and jokes would potentially not have the impact they were supposed to have. This is where, I imagine, Sony Pictures Animation came in with their previous experience on computer generated animation (Cloudy with a Chance of Meatballs, Surf's Up). Providing a fascinating blend of each studio's unique style that compliments each other extremely well. One of those elements in particular, is the humor. 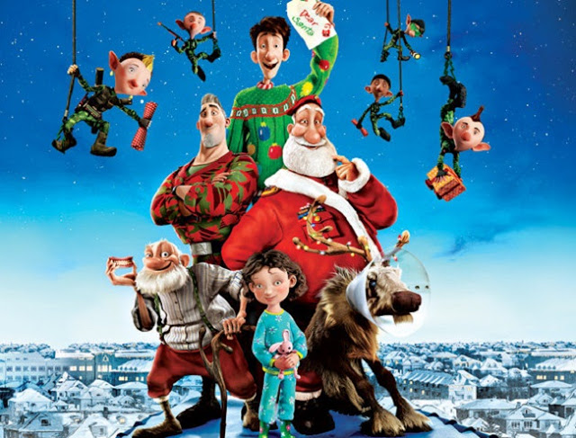 Arthur Christmas may not be as belly laugh inducing as other Christmas comedies, but its jokes definitely hit all the right marks and act as the icing on the cake covering over the emotional core of the story and it's characters. Arthur himself is a big part of this just from his exuberant love for Christmas combined with his adorable, clumsy demeanor. But the characters who truly steal the show are Bill Nighy's Grandsanta, and Ashley Jensen as Byrony (A elf from the gift wrapping division who prides herself at being able to wrap any present with only three pieces of sticky tape). These characters work extremely well off each other and provide another good dose of comedy with their dialogue. To be honest, the only nitpicks I have with this movie is that it does seem to meander in one or two places. However, you could argue that the drawn out journey serves the purpose of fleshing out the characters. 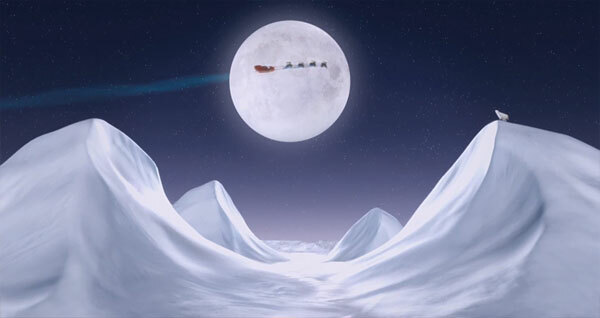 There is also a joke where the sleigh is mistaken for a UFO, thus bringing in the world military, that fell short of being funny because I had; A) already seen it before (Nightmare Before Christmas anyone?) and B) It really served no purpose than to become yet another obstacle for the characters to overcome. Still, for what it was, it served it's purpose and helped to give the story a bit more urgency. Because when push comes to shove, this movie is about the love and respect in gift giving and how there is no one way to do it. As a family film, it would have been so easy to paint Steve's technological additions to Santa's gift delivery as effective but shallow (which it can be at times), while Grandsanta's insistence on tradition i.e. wooden sleigh and 8 reindeer would be lauded as true to the spirit of Christmas. But what makes this film work is that both aspects are showcased with what makes both methods fun and like-able, but also demonstrating their flaws. Both of which reflect the flaws of the characters they represent. Making it easier to root for Arthur, who is very much the audience surrogate, to try and find the middle ground in order to succeed in delivering the last present of Christmas Eve. It is this heartfelt message, tied with a humorous journey and spectacular animation that has earned Arthur Christmas its high spot on my family's holiday film list. Hopefully, it is already a favorite for many of you out there this holiday season. For those who have yet to check it out, treat yourself this year to a standout Christmas comedy adventure that goes above and beyond the call of duty to spread holiday cheer. Arthur Christmas is available for rent on Netflix. The DVD and Blu-Ray are available for purchase on Amazon. The film's Artbook, complete with filmmaker commentary is also available on Amazon.